Store in a cool, dry place. Do not use if safety seal is broken. As with any dietary supplement, consult your healthcare professional before using this product, especially if you are pregnant, nursing, anticipate surgery, take medication on a regular basis or are otherwise under medical supervision. Organic arabica fair trade coffee, organic vanilla flavors, organic coffee flavor, organic stevia extract (leaf), sea salt. Adults mix 1 level scoop in 8 ounces of water up to 2 times per day (scoop included). Can also be mixed with unsweetened almond or rice milk. Not intended for children. Organic vanilla flavors, organic erythritol, organic stevia extract (leaf), sea salt, organic chai flavor. As with any dietary supplement, consult your healthcare practitioner before using this product, especially if you are pregnant, nursing, anticipate surgery, take medication one a regular basis or are otherwise under medical supervision. Suggested Use: Adults mix 1 packet 10 ounces of water. Delicious with unsweetened almond milk. Not intended for children. Adults mix 1 packet in 10 ounces of water. Delicious with unsweetened almond milk. Not intended for children. Suggested Use: Adults mix packet in 10 ounces of water. Delicious with unsweetened almond milk. Not intended for children. Heat can denature proteins, reducing their availability to your body. 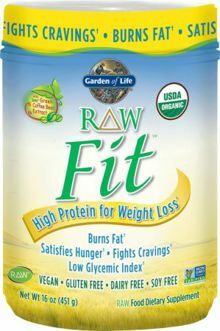 But Garden of Life's USDA Certified Organic plant proteins are different; always gently produced at low temperatures, without any added fillers or carriers (like maltodextrin which can come from GMO corn) preserving their complete amino acid integrity and whole-food, Certified Organic, Non-GMO goodness. Garden of Life's commitment to sustainability begins with organic farming. CERTIFIED ORGANIC plant protein from sprouted grains and legumes is truly good for our planet, unlike conventional farming practices that utilize 150+ synthetic pesticides leaching into our water supply and soil, promoting genetically modified seed crops and reducing our planet's biodiversity. In addition to CERTIFIED ORGANIC farming practices, Garden of Life uses recyclable packaging, vegetable inks, sustainably farmed papers and 100% certified renewable wind energy credits to run our company's operations.